I know this dog! He's peed in my purse! Tobi is a model!!! !, originally uploaded by MissJHyde. How about that?!?!? 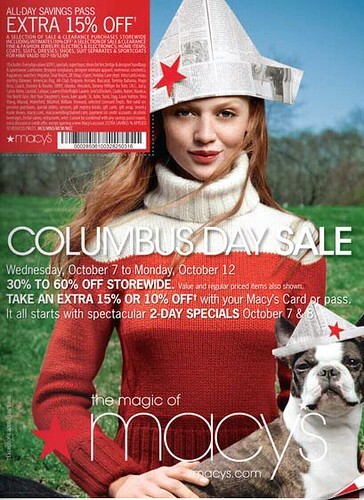 Tobi is on the cover of a Macy's circular!!! Tobi is my in-laws show dog. He's a handsome, snobby little fella who hates getting his face dirty....and loves to snuggle! which BT does not love to snuggle? how did he get that job?!?!?! Not real sure....his doggy agent called and booked him this gig back in April sometime! The photos were taken out in the Hamptons. So cute. How did they get the hat to stay on his head? My dogs hate having things on their heads!